Photos for the next few days will come from a sunrise boat ride on the River Ganga in Varanasi. The River Ganga is considered one of the holiest rivers in India and the city of Varanasi is a very sacred place for the Hindus, Buddhists and Janis. 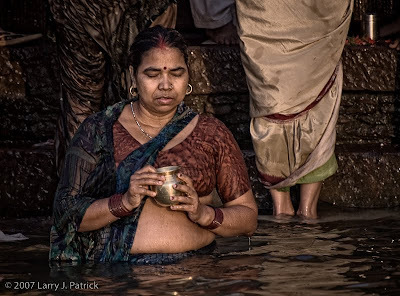 Each morning and evening, thousands of pilgrims go to the river for a ceremonial bathing. After looking at the river, there is no way that I would take a bath in it. In this photo, I really like the way the morning light reflected off of her colorful clothing. I wanted the photo to reflect her quite, solitude. Camera settings: Nikon D200, Nikon 70-300mm f/4.5-5.6 at 300mm shot at ISO 200, f/5.6 and 1/60th of a second shot from a boat. Photoshop—used nik Color Efex Pro tonal contrast to add highlight, mid-tones and shadow contrast and used nik Silver Efex Pro to add a black and white layer at 15% opacity. Obviously, the viewpoint really adds impact to this photo. Being a Luddite at times, doesn't the B&W layer, even at 15% opacity, reduce some of the color? In spite of the reflective mood of the woman this is a powerful shot. Great job on capturing the moment. This is a photo that makes you stop and think about what you are seeing. The color combination works well with the feeling of the image. Good job. The image pulls you in. As you look at it, you want to know more about the subject, what she is doing and what is going on. Very moving photo. You captured her quite solitude well. The composition with only the top of one woman and only the bottom portion of another woman seems a little odd however it seems to work. Like the simple color scheme. I like her expression. It says it all.